What side effects does the contraceptive pill cause? "The contraceptive pill can cause side effects and many women have to try several pills before they find one which works well for them." The pill is a popular contraceptive but many women are confused about its side effects and safety. Which side effects can it cause and are they dangerous? With news headlines about the pill, thrombosis and cancer, it can be difficult to make sense of the health implications of the pill. Find out which side effects you may experience on the pill and what they mean. Which side effects can the pill cause? Which side effects require medical attention? Does it increase your risk of cancer? Does it increase your risk of thrombosis? It is difficult for your GP to determine which contraceptive pill will cause side effects in you. Many women do not experience any side effects while using the pill but you may need to try a few different pills before you find the one which works best for you. Every woman reacts different to a certain pill and different pills cause different side effects. Like all other medicines, the pill can cause side effects. They do not affect all women and they often improve after the first three months of taking the pill. It can take up to three months for your body to get used to the hormones. With every contraceptive pill having slightly different side effects, you should always read the patient leaflet of the medication you are taking. There are a range of other, rare side effects that may occur in a small number of women. While most side effects of the pill are temporary and harmless, there are some symptoms you should not ignore. These side effects are rare to very rare but they can indicate a serious condition such as an allergic reaction, a problem with your liver or cancer. If you suffer from any abnormal side effects which bother you, you should always discuss them with a doctor. Contraceptive pills which contains oestrogen have been found to cause a slight increase in your risk of breast cancer. Women who take the pill have also been found to have a slightly higher risk of cervical cancer. However, it is not entirely clear whether this is caused by the pill or different sexual behaviour. Women who take the pill may be inclined to rely on the pill instead of condoms, which leaves them vulnerable to catching hpv, a virus which can cause cervical cancer. At the same time, the contraceptive pill appears to protect against ovarian cancer, bowel cancer and cancer of the womb to a certain degree. Preliminary research results indicate that women who have been taking the pill may be 20% less likely to contract bowel cancer. If you have a family history of cancer or know that you have a high risk of cancer (for example because you have already had it) your GP may not recommend that you take a pill which contains oestrogen. The slight increase in your cancer risk is not permanent and within ten years of taking the pill, it returns to normal. 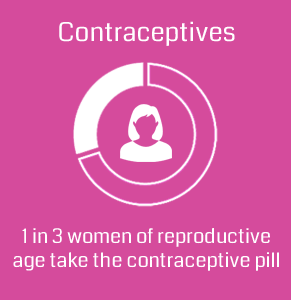 Taking a contraceptive pill which contains oestrogen also slightly increases your risk of thrombosis. It is therefore not recommended that women who have a high risk of stroke or thrombosis take such a pill. If you are over 35 and you are a smoker, your GP will recommend that you take a minipill instead. The same applies if you are very overweight or have a family history of blood clots. A study about the pill and thrombosis conducted by the MHRA showed that 1 in 10000 women who do not take a contraceptive pill develop thrombosis. Out of 10000 women who take the pill Yasmin for example, 2 - 4 will develop thrombosis. However, the data for pregnant women showed that pregnancy increases your risk of thrombosis far more than the pill, with 6 in 10000 pregnant women developing the condition. Fiction: You need to take regular breaks from the pill. Fact: Incorrect - If you are happy with your pill and it isn’t causing any side effects, you can continue taking it until the menopause. Fiction: The pill makes you gain weight. Fact: Some women experience weight gain while taking the pill but this side effect does not affect all women. Some pills, such as Yasmin and Cilest, are less likely to cause water retention and the associated weight gain. Fiction: The pill is bad for your health. Fact: While the pill can cause a slight increase in your risk of certain conditions, it also lowers your risk of other health problems, such as bowel cancer. It can also improve acne and reduce period pain. Fiction: The hormones you take accumulate in your body. Fact: The hormones in the pill do not remain in your body for long, that’s why you have to take it every day.